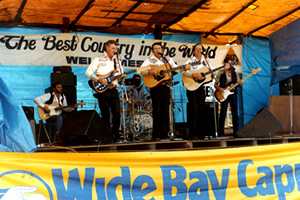 Each year Gympie plays host to the National Country Music Muster with over 60,000 attendees. The muster came about in 1982 when Gympie-based country music trio, Marius, Fabian and Berard Webb, hosted an event on their property to celebrate winning a Golden Guitar award at Tamworth, and also to commemorate the centenary of their family's cattle property, "Thornside". With help from the local Gympie Apex Club, the weekend included a dinner, ball and musical acts. When a staggering 6000 people turned up, along with the ABC's A Big Country camera crew, and $12,000 was raised for charity, the Webb brothers and Apex Club agreed to make it an annual event. The event grew and was relocated to the current site at Amamoor Creek State Forest. 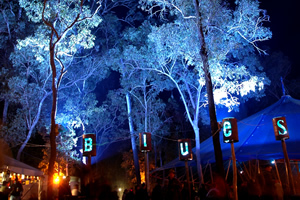 Every year for six days and nights, the towering gums of the forest play host to the thousands of families, country music lovers and tourists. Over 13 different stages and venues blast out 170 shows of traditional and modern country music, plus an aural collage of folk, bluegrass, balladeers, gospel and blues. Add to that bush poetry, clogging, line dancing, swing, and rock 'n roll and there's plenty to keep every toe tapping. Each year the Muster opens up the Gympie region to a huge influx of local, interstate and international visitors bringing an economic and social boost to local businesses and the community. Since its inception, the Muster has raised over $12M for charities and community groups.